The René Le Gall garden is an “off tourist road”, located near Place d’Italie and the entrance is on the street Corvisart. 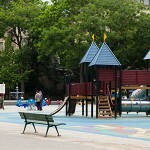 You’ll find there an access ramp for strollers and will arrive on the large playground, where there are also swings. In the other areas, you may stroll through the aisles surrounded by trees and discover its roses garden. For having a picnic with your family, tables are available or you may chose to lay in the grass. In short, there’s something for all ages! 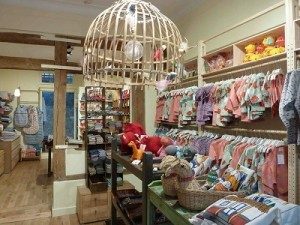 In Le Marais, I found out this pretty colorful store of baby and children clothing with colored shirts, baby sleeping bags, trousers and much more. “ie” designs its own fabric and have it printed and assembled the traditional way in its workshop. 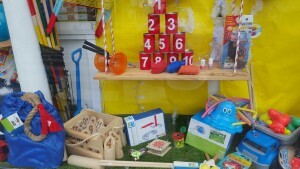 The store also sells vintage toys such as metal trains and cars, puzzles, books for children. ie collections are also sold in its second store in Paris on Butte Montmartre. 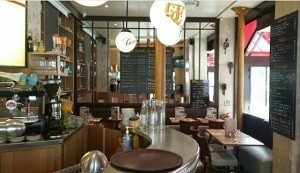 2 steps from the lively rue Daguerre (with its typical Parisian food stores) and place Denfert-Rochereau, we found out this pretty independant 100% dedicated to kids. You’ll find there a selection of toys for all ages, building blocks, dolls, cuddly bears but also children’s room decoration and baby products.